The atolls of the Maldives form the central part of a tremendous underwater mountain range stretching for over 2,000 km from the Laccadive Islands, in the north, to the Chagos Islands, in the south. The Maldives cover an area of 90 000 square kilometers and lie between latitude 7° 6’ 30” N to 72° 32’ 30” E to 73° 46’ 15” E. Estimates of the number of islands differs, depending on the definition of an island. Officially there are 1190 islands with some form of vegetation on them, whether grass or bushes or trees. Of this number, 991 are uninhabited and 199 habited. Unofficially, there are 1120 islands, but the actual number varies from one year to the next as islets are continually being washed away and new ones formed. The islands are divided into 26 geographic atolls. Minicoy is the 27th atoll, but it was linked to India in 1753 during the time of Sultan al Mukarram Mohamed Imadudeen III (1750- 1757 AD). For convenience, these atolls are divided into 19 administrative groups and named according to the letters of the Maldivian alphabet. In the resort atolls, Felidhoo Atoll is now referred to as Vaavu, Ari Atoll as Alifu, Malé Atoll as Kaafu, Faadhippolhu Atoll as Lhaviyani, South Maalhosmadulu Atoll as Baa, and Addu Atoll as Seenu. Charles Darwin proposed that the atolls of the Maldives developed as the mountain range gradually subsided into the sea or the sea levels rose. 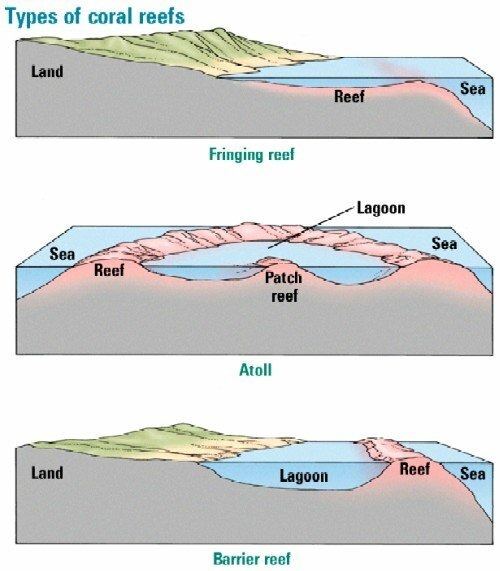 The fringing reefs surrounding these mountains built up and became more distant from the center of the range until there was nothing left but a circle of reefs enclosing a lagoon, called an atoll. During a seismic survey by Esso in 1980, a well sunk near Bandos concluded that a volcanic base lay beneath 2100 meters of limestone, supporting the subsidence theory of Darwin. Coral reefs are created by tiny animals called polyps, which secrete a hard limestone skeleton, which provides the reef framework. 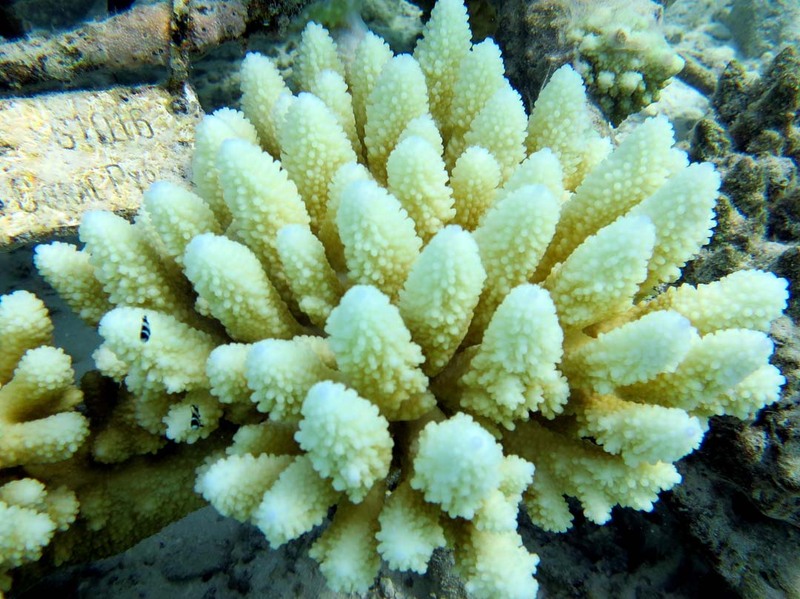 Fragile branching coral may grow between 20 and 30 centimeters per year, while massive boulder-shaped coral may grow only a few millimeters per year. Coralline algae, which thrives in areas exposed to wave action and places too deep and dark for coral, cement the framework of dead and broken coral together forming a solid limestone base. The type and shape of reef developed depends to a great extent on the depth and the shape of the ocean floor, the currents, the recent geographical history of the area and degree of exposure to wave action. Yet, coral reefs have not always existed as they do today. During the ice ages, falls in sea levels forced reef-building away from the reefs to colonize new areas. At the same time, reefs were left high out of the water. The limestone reefs were readily eroded by fresh water, and this led to the formation of caves and canyons of all shapes and sizes. After they were re-flooded by the sea, marine life re-established itself, and layers of coral and coralline algae continued to grow upon the eroded gutters and valleys. These eroded substrata largely govern the shape of modern reefs today, and many of these features remain submerged providing divers with spectacular natural formations. 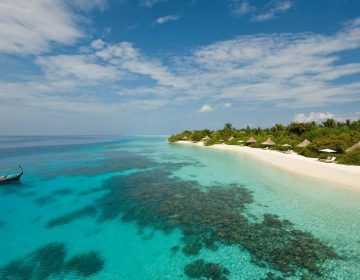 The names of the atolls, islands and coral reefs of the Maldives have a curious mixture of spellings, resulting in many simplifications to make titles more readable. In some cases, original meanings of words have also been changed. For instance, the word atoll is the only word in the English language of Dhivehi origin, coming from the word atholhu. 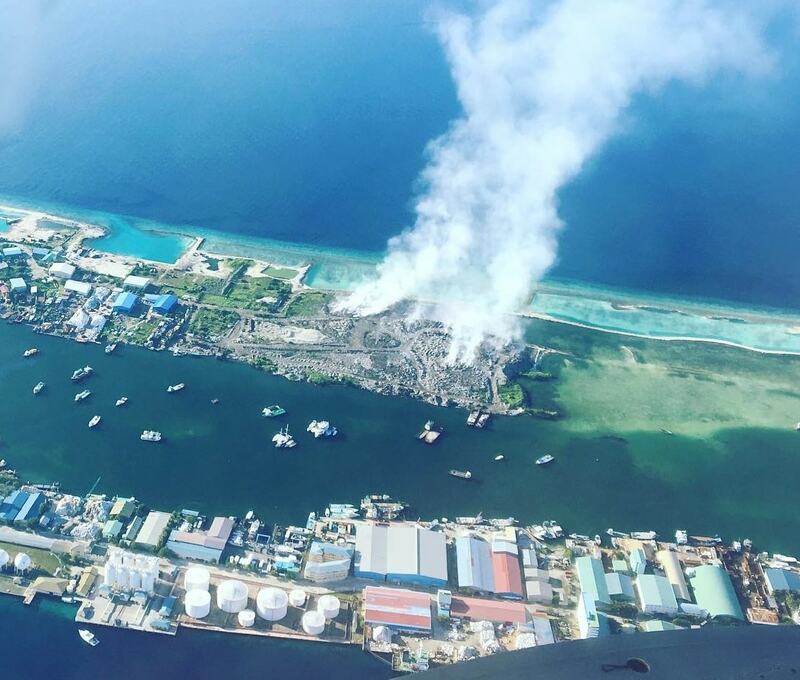 The Oxford definition of an atoll is a ‘ring-shaped coral reef enclosing a lagoon.’ However, an atholhu is an administrative district, sometimes covering more, or less, than one atoll. Different maps of the Maldives rarely have the same spellings. On some, Ihavandhippolhu Atoll, at the very north of the Maldives, is sometimes named Ihavandiffulhu Atoll. The original meaning of polhu is portion and refers to the upper section of islands in the Maldives; whereas fulhu is the name of a person. Felidhe-Atholhu is the old name of the atoll now called Felidhoo Atoll. It is sometimes abbreviated to Felidhu Atoll. 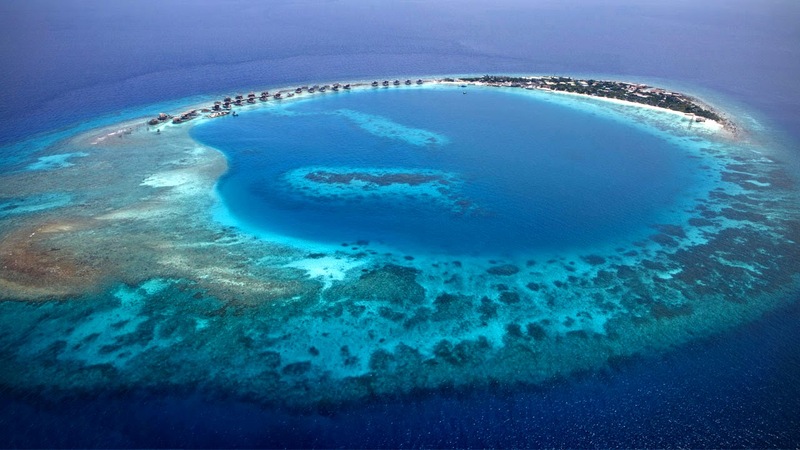 Likewise, Nilandhe- Atholhu is an old atoll name which is also called Nilandhoo Atoll. Huvadhoo Atoll in the south is sometimes named on maps as Suvadiva Atoll, which is another more recent name and Goidhoo Atoll is also called Horsburgh Atoll. Island names can often be traced to a particular characteristic of an island. For instance, Thudufuhi is an island in Ari Atoll. Thundu means edge or point, and this island lies on the eastern point of the reef. Other island names refer to an incident that may have occurred there. Dhehansanu Lonu Bui Huraa is an island in Ari Atoll and is an old name meaning ‘two [men named Hasan] drink salt water island.’ Other islands and reefs are old words of Sinhalese origin, such as Lankanfinolhu, Vihamanaafushi, and Furanafushi. Reef names, too, can have interesting origins. 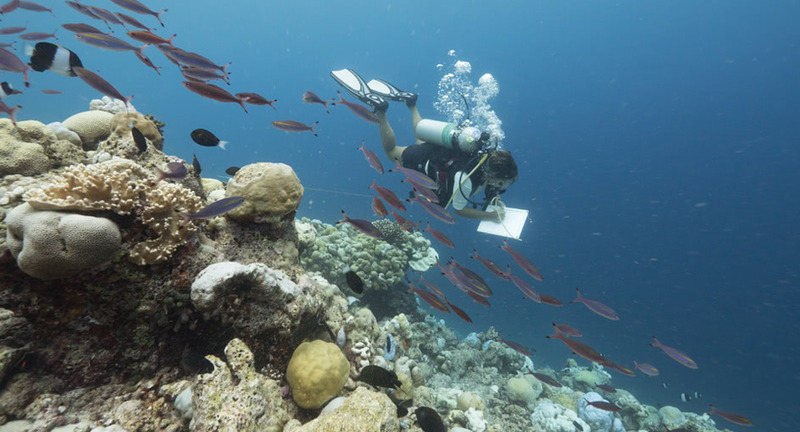 Himmiyafaru, in the north-west Malé Atoll, can tell fishermen much about the reef. Himmi means the gap between two objects, and in this case, the reef is divided into two parts by water. Another reef with a story is Koonimasfaru, in the north of Malé Atoll. The name Koonimasfaru means spoiled fish, and it is widely believed that a whale was caught inside the reef and became stranded and died when the tide receded. 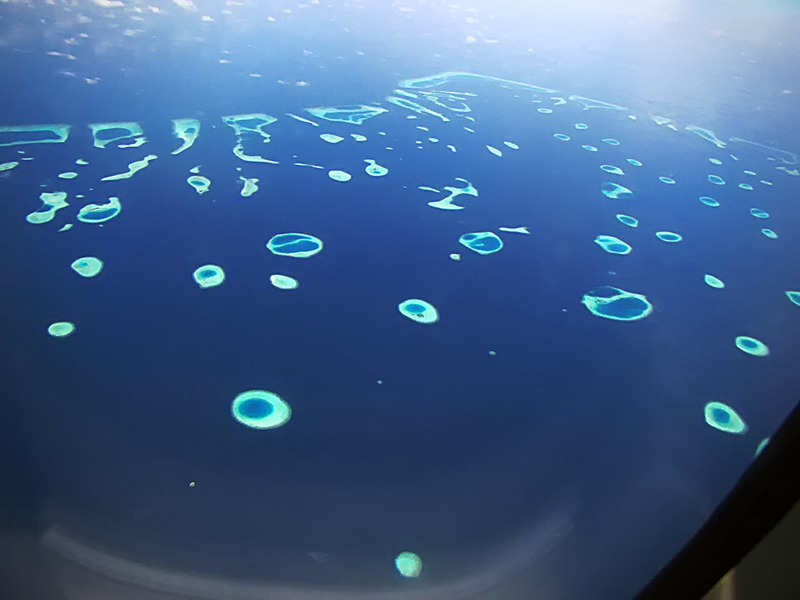 The resultant smell is said to have drifted across the island of Gaafaru, thus giving the reef its name. 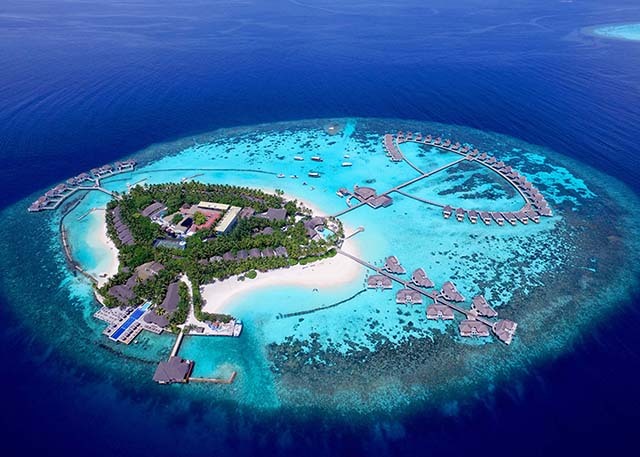 Many islands, like Vihamanaafushi, Velassaru, and Medhu Finolhu, have adopted new names since the arrival of tourism. They are now called Kurumba Village, Laguna Beach Resort, Reethi Rah Resort, respectively, but many locals still call them by their traditional names. There are many words in Dhivehi used to describe an island. A fushi is a big island usually on the outside reef of the atoll. Meerufenfushi, Kandoomafushi, and Farukolhufushi are examples. 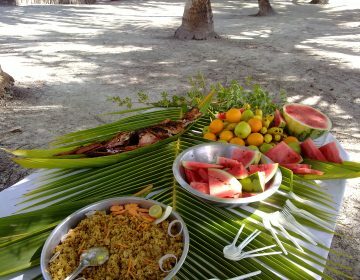 A finolhu is an island with few or no coconut trees. Islands like Dhigufinolhu, Kanifinolhu, and Eboodhoofinolhu, have grown in size since early times but have retained their names, despite having many more coconut trees. Dhoo and Huraa are other words for an island and le, as in Malé, is a contraction of the Sanskrit word liu, meaning island. Reefs are usually called farus or falhus. A faru, is reef partially exposed at low tide and a falhu is often a reef encircling a lagoon, sometimes with one or more islands inside. Gaa and haa are other words to describe coral reefs. A giri is a name for a small patch of coral close to the surface. Most island resorts have their own bodu giri (big reef), and kuda giri (small reef). A thila is a coral reef is usually a few meters below the surface. Many dive sites, such as Okobe Thila, Nassimo Thila, and Miyaru Thila have names that indicate the presence of such a reef formation. The channel between two reefs is called a Kandu olhi in Dhivehi but is simply called a kandu. There are many other names describing the natural features of the islands which the curious traveler will come across but is maa kandu – the big sea outside the atoll – in which most divers will discover the real attraction of the Maldives. 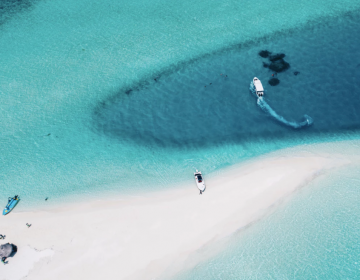 The outer reef slopes of the atolls are generally distinguished by greater depths and increased water clarity with visibility sometimes exceeding 50 meters. Looking down the reef slope, the coral communities change rapidly with increasing depth, and at depths of more than 20 meters, wave surge is non-existent and extensive coral growth may occur to up to depths of 50 meters and more. Light availability is the main factor limiting the range of coral here. The upper parts of the outer reef slope may be affected by wave action, restricting the growth of more delicate plate coral. Coral growth can be wiped out in a single freak storm in this zone. In areas less exposed to wave action, extensive stands of staghorn Acropora can dominate, and a great variety of fish life occurs among the coral in this zone. The reef front is the part of the reef that takes the full force of the ocean swells, and the coral here tends to be gnarled stunted as a result of the pounding by the waves. The reef flats can range in width from a few meters to a few kilometers and rainwater can damage or completely destroy the coral in this zone if heavy or cyclonic rainfall coincides with very low tides. Lagoons with proper circulation of water may have large stands of Acropora growing on the sand and can trap many fish varieties as the tide recedes. 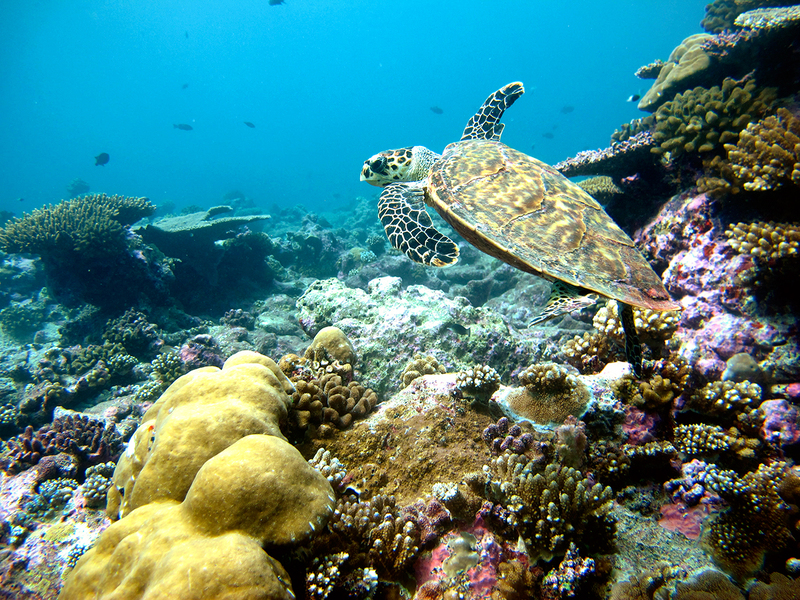 On the inner reef slope, coral growth may be rich if the slope is not too steep. Steep or vertical slopes may be bear, however many interesting caves, overhangs and gullies occur in this area. The atoll floor consists mostly of sand and rubble and is usually at a depth of between 30 and 50 meters. Rising from the floor are giris and thilas with the giris nearly reaching the surface, and the thilas lying below at depths between five and 15 meters. On World Environment Day, June 5, 1995, the Government of the Maldives announced the establishment of 15 Marine Protected Areas within the major tourist atolls. This is the first step in protecting popular dive sites from the detrimental effects of over-fishing, coral mining, anchor damage and rubbish. Awareness for the need of Marine Protected Areas was brought about initially by unrestricted shark fishing, especially at world-renowned dive sites such as Fish Head (Mushimasmingili Thila) and Lions Head. Between 1995 and 1996, shark fins were fetching up to US$70/kg, so there was a great incentive for fishermen to meet growing demand. The number of sharks at some dive sites today is less than they were just a few years ago and over-fishing, if unchecked, poses long-term problems for the diving industry. In the past few years, the number of people entering the aquarium industry has increased, and the business is expanding rapidly. Many divers visit the Maldives especially to record and photograph the small and beautiful fish that find their way into private fish tanks. Since most of these fish are taken from areas close to Malé, this industry, also, could be in direct conflict with the recreational diving industry. 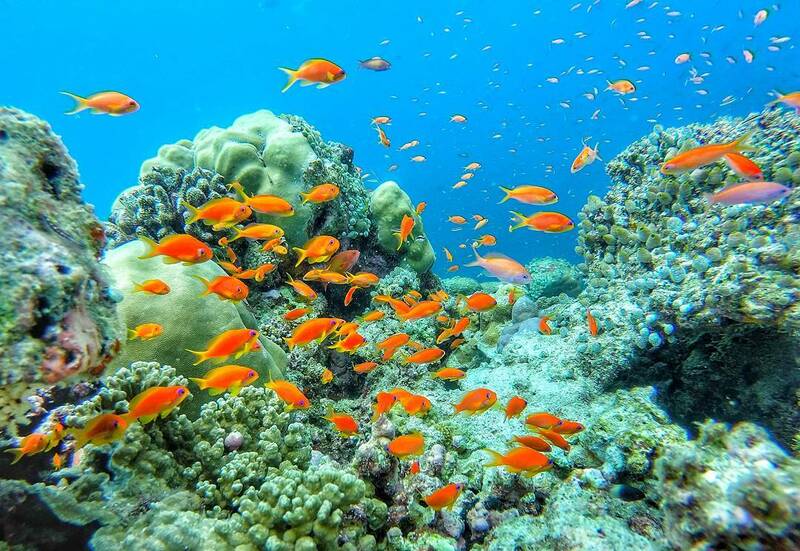 Steps have been taken to introduce a quota system for those species that are considered rare in the Maldives, and it is hoped that these measures will help protect existing aquarium fish stocks. In 1993, the grouper fishing industry started, and it took off in 1995 with alarming intensity. With a big demand for grouper, especially in Asia, and high prices being paid for their delicate flesh, private exporters have been quick to exploit the opportunity. Currently, local fishermen can fish without restriction on numbers and sizes to fill the demand of Asian markets. Live grouper are shipped monthly to Asian markets, and ice-chilled grouper are air-freighted to Singapore . Experienced long-term divers believe grouper and other fish stocks on many reefs of the tourist atolls have been affected by over-fishing. Many resorts themselves allow fishing at dive sites and must share the blame. Controls on grouper fishing are now being looked at, and a possible remedy in the future is envisaged. At the beginning of 1995, the giant Napoleon fish, or hump-headed wrasse was starting to make an appearance in the chilled export bins bound for Singapore. With fishermen receiving up to US$50/kg for Napoleon, the big fish were being hunted mercilessly. However, following protest from all quarters, the government has now banned all export of Napoleon fish. Sea cucumbers have been over-fished in the past, and a ban on scuba diving for them, now in force, is expected to allow for deeper ones to regenerate. Sea cucumbers are regarded as the vacuum cleaners of the ocean floor, and the consequences of their removal from the eco-system are not fully known. Collecting black coral for jewelry has been banned from January 1995, and coral mining for building purposes has been restricted to specific areas to protect the existing reefs and give them a chance to keep up with predicted sea-level rises. Imported turtle products have been banned, and a total ban on turtle collecting has taken effect. Tourists are now being made aware that their purchase of jewelry or gifts made from turtle shell are a threat to the turtle population. Purchase of shark jaw is also discouraged. 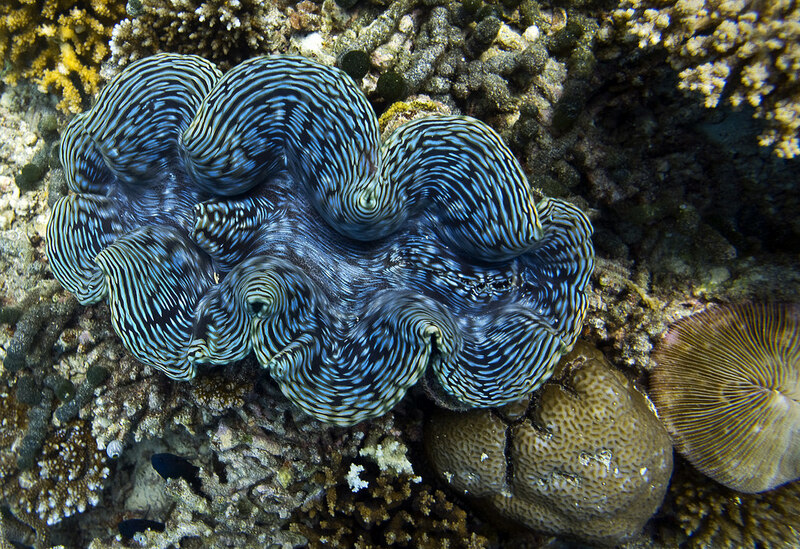 Giant clams were collected without restriction until 1991, and their absence on the reefs is often overlooked. The export of clam meat has been banned, but large quantities of shells remain. Anchor damage at dive sites, especially thilas, was considerable in the past but most people are now aware of the damage anchors cause to the coral and adopt different diving techniques. If a line has to be secured at a site, then it is up to the dive master to dive down and tie a rope rather than use an anchor. However, damage to the coral from the divers, especially inexperienced divers in a current, continues to be a cause for concern. Every diver master should restrict diving at sensitive sites to be the ability of their least experienced diver. Rubbish is a general problem not confined to dive sites. It is one of the most visible signs of human impact and one of the most challenging problems to control. Rubbish is often seen on the open seas and washed up on the reefs of some resorts and uninhabited islands. Rubbish comes from several sources. Tourist consumption leaves tons of garbage to be disposed of, and all resorts are now required to have compactors and incinerators, but these are not always used. Maldivians have traditionally thrown their waste materials, mostly coconut products, into the ocean, but with increased wealth and the availability of packaged goods, many of those wastes are being disposed of in the same way. On some inhabited islands, rubbish is dumped on the edge of the island only to be washed away on the high tide. Malé, with a transient population of more than 80,000 people, now disposes its rubbish burden at Thilafushi, a newly created island, and one of the fastest growing, near Villingili. In the past, much of Malé’s rubbish went into the sea off the island capital, but with increased awareness divers have removed much of the garbage during cleanup days. However, rubbish disposal on outlying inhabited islands continues to be a clearly visible problem. The number of safari boats has increased exponentially in the past ten years and disposal of rubbish from the ships is another cause of the problem. Many tourists give little thought to what happens to their waste products. In some cases, these are conveniently and quietly disposed of at night or while guests are diving. Some rubbish, such as crushed cans and food scraps can be disposed of at sea while outside the atolls, but all other rubbish, such as plastics, containers, and batteries should be returned to Malé and disposed of at the harbor in the correct manner. Divers visiting tropical waters for the first time should realize that accurate buoyancy control is the most essential skill to learn for the protection of the marine environment. Photographers need to pay particular attention – responsible underwater photography over live coral requires divers to photograph while maintaining correct buoyancy control. Divers should be careful not to kick or break the coral with their fins and hold only dead coral. Fish feeding at dive sites is discouraged as this upsets their natural feeding habits. Divers are often tempted to chase or touch the fish, mantas, and turtles, but this makes them frightened and less inclined to return. 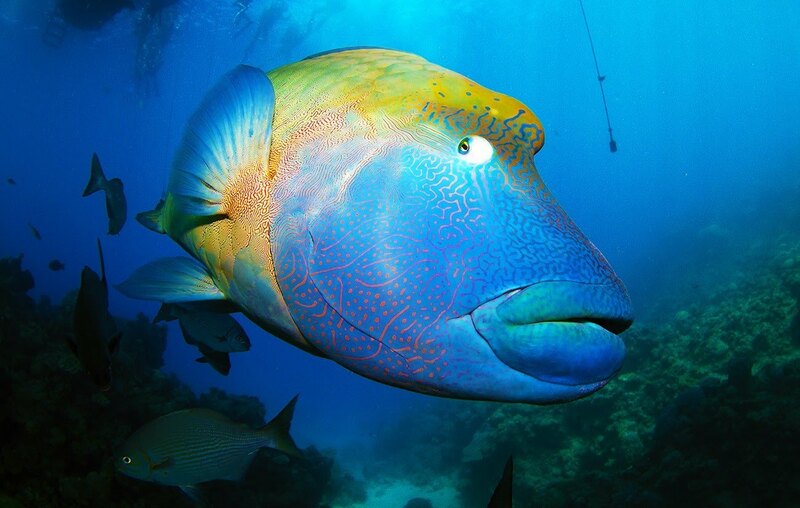 Handling fish like grouper and moray eels may remove the slime coating the skin, leading to infection of the fish. Divers are not allowed to harpoon fish, collect lobsters, corals or shells (dead or alive) or any other animal. Lobsters are often available from the resort – but every lobster eaten is one less to be seen underwater. Shells and coral jewelry can be purchased at some resorts and inhabited islands, but many people take a dim view of this practice as it works against the protection of the marine environment. Fishing at all dive sites should be discouraged, and anchor dives should not be made.